Have you noticed how some people in your life seems to go missing when you’re going through a difficult time? It’s true that you really do find out who your friends are when you’re struggling. So it is not a surprise that no matter what you’re going through, God stays with you always. Even when you feel alone, scared or just struggling to face life, God is there with you, and will never leave you alone. Negativity and negative thoughts can be one of the worst things you ave to cope with, especially when the negativity comes from within you. So if your life is filled with self-doubt, pray. If your life is filled with negative thoughts, pray. In other words, pray, as prayer is the one thing that can bring you the positivity that only God’s presence can bring to your life. God alone can shield you and help fill your mind with all things good. 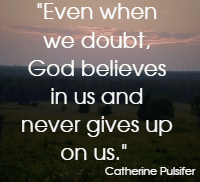 So go on, don’t doubt God, instead trust Him. Aren’t these reassuring words? – “Earth has no sorrow that heaven can’t heal”. So no matter how much sorrow we have to endure, or how much pain physical or emotional pain we have to go through, God can, and will heal us. But how do we do that? So even if you feel broken, or you turned away from God many years ago, God still wants you to come to Him because He still loves you. Come to Him now, just as you are, and leave your pain and hurt with Him. How many people do you know who would accept you just as you are? How many people do you know who you would accept just as they are? There is of course one person who accepts each of us, just as we are. In fact He encourages us to come, just as we are. It is of course God. Jesus encourage everyone to come to him because he could provide the nourishment and help we each need. Who else can do that! Therefore no matter what your need, or what problems you face, come to God, because He can and will help you. When we call out to someone, you hope they hear you and respond as quickly as they can. When we call out to God, He will respond to us before we even utter a sound, because He knows what we need even before we know we’re in trouble. God’s love is fierce. He loves us, and cares about what we do. He doesn’t want you to turn away from Him, so he will fight fiercely for us. God will never let you down, even through the fiercest of storms, so trust Him. Healing rain! That sounds ridiculous doesn’t it, but it is true, there is such a thing as healing rain – It’s not physical rain, but a way of describing the pouring out of God’s love for each one of us, so that we are soaked in His love. One of my favourite songs is Michael W Smith‘s Healing Rain. and it reminds us of God’s love raining down on us. As I said in yesterday’s blog, life can sometimes make us feel like we’re getting soaked by difficult life events. That’s why I think I like this song because even when we’re hurting physically or emotionally, it reminds us that if we let God’s love pour over us He can heal all our wounds.